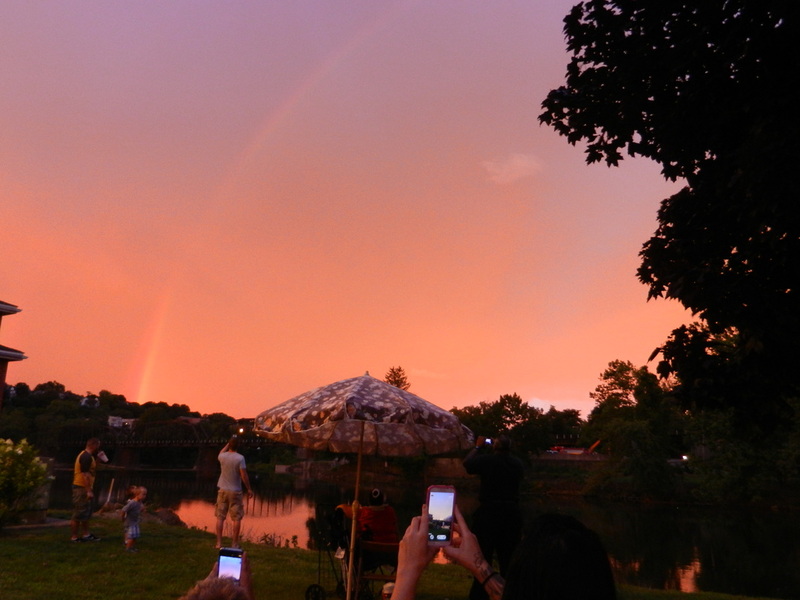 Music, Arts, History, Fireworks and nature's surprises! The last stop was Easton's Heritage Day on Sunday. This one had it all. Arriving a little after 2 p.m., I started with at the west end of the square on Northampton St. I was not disappointed right off. Live music, food / beverages and an exhibit of World War 2 vehicles gave a great idea of what was to come. When I said Heritage Day had it all, I am not joking. A few of the things going on, I did not have time for. Trolley Tours of Historic Easton and College hill / stopping by some historic houses were on the list. I tried. Time to focus on what I did experience. The square featured a lot of vendors, information booths, more food / beverages. Taking a left off Northampton, I walked up north 3rd st. About half-way up, a classic car show! This fit in perfectly with the history side of Heritage Day. The cars were parked on both sides of the street. East Northampton St., going towards the Delaware River, had a children's section. Heavy machinery (backhoes, dump trucks, etc.) were parked for kids to climb on. Safety helmets were available to really get kids using the imagination. They also experienced face painting, and other fun things. Continuing around the circle (square / sidewalks form the square, street the circle). I headed down south 3rd st. Here was the beer tent (had to mention it). A main stage with live music. I caught part of Maria Woodford Band. With the four corners covered, I walked around the circle and fountain. Local vendors had organic food available. The Easton Farmers' Market had a tent. Just to name a few. Everywhere you walked and looked, the square and streets were alive with history, music, arts, food, beverages. This was only the first half. Closing one section. Opening the next. Around 4 in the afternoon the square started closing down. Easton's mayor, Sal Panto Jr. gathered everyone at a stage on the north side of the circle. Inviting children and their families to participate, he led a parade down Northampton St. to the river part of Heritage Day. The river part is where things became a little interesting with nature. After taking a little break at Valenca restaurant with friends, I headed down to the Delaware riverside. This part was slightly scaled back with less space. Walking up Larry Holmes Drive, there was a mix of carnival style and local food vendors. Pretty much what I expected. The riverside part had the music! Bands, including The Large Flowerheads / Bank Street Band (School of Rock) / The Great White Caps performed on 2 stages. The Grand Finale of Heritage Day and 4th of July weekend! What a grand finale it was. People crowded the Easton side of the Delaware and free bridge. Night arrived and the suspense was building, especially with the constant threat of rain. The show started and lit the sky and river with colors and sounds! The rain started at the same time. Hey, it added a different aspect to the experience. Like the previous shows I saw this weekend: the start was like a finale. Varying in pace throughout the show, a surprise came towards the end. A display was lit with fireworks of the American Flag on the Phillipsburg side. The grand finale? Unfortunately, the camera could not justify it or capture the entire height / width and rush of it. 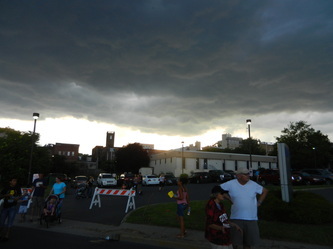 On a hot 4th of July weekend, where nature became a little unpredictable; people crowded the streets of Easton's square and riverside. Families and everyone had fun experiencing all the music, arts, vendors who were there. The fireworks show really provided a great grand finale to a crazy weekend that started on Wednesday evening. Even though a few days have passed, I still experience the rush I had at Heritage Day and the entire weekend. A special Thank You: the City of Easton, Mayor Sal Panto, all the musicians, volunteers, vendors, artists who made my first Heritage Day memorable. Another special Thank You to Easton's police department. They did a great job being very visible and friendly. Yes, I did talk to a few about Heritage Day. There was one, minor, incident I heard about. A small fight broke out in the evening by the river. The police navigated the crowd and had things under control quick.